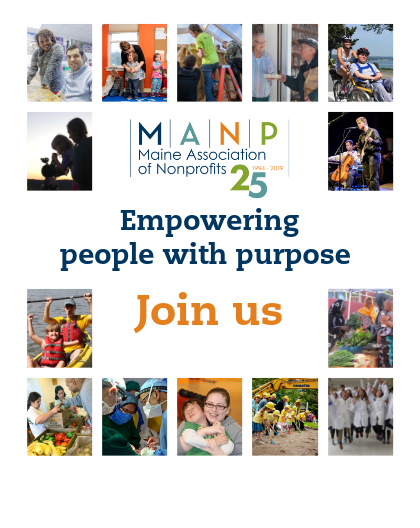 The Maine Association of Nonprofits (MANP) enriches Maine communities by empowering people with purpose—people and organizations at the forefront of the issues and opportunities that will determine Maine’s future prosperity. As a leading advocate and resource, we ensure that Maine nonprofits are adapting, thriving, and contributing in a fast-changing world. Exercise bold leadership to increase the influence of Maine nonprofits as valued partners in advancing solutions. MANP is a member of the National Council of Nonprofits, a network of nonprofit state associations across the country.